Growing most of the vegetables on this site in containers is easy! There are few simple things to remember. The soil in our beds is a heavy clay base, even with considerable improvement the results with carrots are a little hit and miss. Container growing offers us the opportunity to create the right growing medium for particular plant. This is a good mix for root-crops such as carrots, beetroot, and all sorts of other leafy crops, such as leeks, spring onions and chillies. Use a bag of topsoil (25l bags of JA Bowers or Westland top soil is readily available at garden centres) and mix in an organic soil improver (finely shredded composted bark is a good one) or organic compost about 1 part improver to 5 parts soil. Unless you have perfect sandy loam in your garden, don't use ordinary garden soil. You'll be able to re-use the loam later by refreshing it with some organic fertiliser, compost, or soil improver. Topsoil is generally much more re-usable than compost as the structure is more stable. There are proprietary "root vegetable" growing mixes and grow bags available now, if they are a good price in your garden centre, give them a go. Position the pot where it will get sun for at least 4 hours per day. More sun is usually better, but some shade is no bad thing as pots in full sun will need more watering than pots that are in shade for part of the day. Fill a pot that is at least 30cm deep and wide with the mixture of topsoil and soil improver, leaving around 5cm space from the top when gently firmed down and watered, this makes watering much easier as it won't spill over the side before it's had a chance to soak into the potting mixture. Give it a good watering, say half a watering can. Next, sow the seeds singly spaced as required for the vegetable you're growing. Sow in a spriral, starting from the centre of the pot. The spiral sowing method helps to create even spacing. After sowing the seeds, cover to the appropriate depth (on the packet) and water again with a sprinkler (rose) attachment on the watering can. 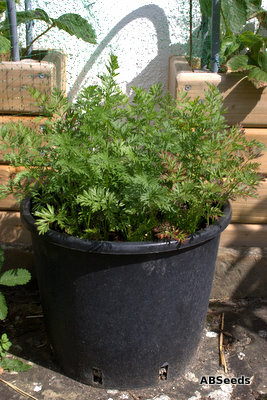 The only real disadvantage with growing vegetables in containers is that you have to be more careful with watering. Never let the compost dry out completely or it will be really difficult to re-wet and your veg will suffer. Larger pots require less frequent watering than small pots, pots in full sun will need more watering than pots that are in light shade for part of the day. When you water, make sure you water deeply so that the water gets down to the roots where the plants need it, rather than just wetting the top where it will evaporate away. You can install trickle irrigation and automatic waterers, but there's something quite relaxing about taking the watering can for a walk on a pleasant evening. Some plants are heavy feeders, the easiest way to manage this in pots is to use an organic slow release feed that should last 3-months over the main summer growing period.